Redbarn's Protein Puffs are an innovative, tasty, and healthy treat for dogs! Our cheese flavored Protein Puffs are packed with protein derived from human-grade caseinate, commonly used in health supplements, snacks, protein bars, and diet products. 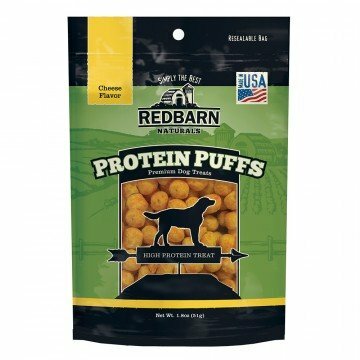 Redbarn's Cheese protein Puffs for dogs offer a unique combination of protein, natural ingredients, and essential amino acids without any artificial preservatives, flavors, or colorings. Light and crispy, your dog will beg for more! Dried Milk Protein, Dried Cheese, Salt, Turmeric, Mixed Tocopherols (A Preservative).